Cut the potatoes into 1-inch chunks. Place in a large stockpot, cover in cold water and add a teaspoon of kosher salt. Set over high heat, cover, and bring to a boil. Lower the heat to medium and simmer for 15 to 20 minutes or until fork tender but still firm in the center. Drain the potatoes in a colander, then place them back in the empty stockpot. Cover with a lid and shake the pot vigorously for a few seconds, until the surface of the potato is fuzzy; this will help the formation of a crust. Season potatoes generously with salt. Add the oil to a 13x18 inch sheet or roasting pan and place in the oven until oil is hot and almost smoking, about 5 minutes. Remove the roasting pan and carefully add the potatoes. Return pan to oven and roast for 30 minutes. 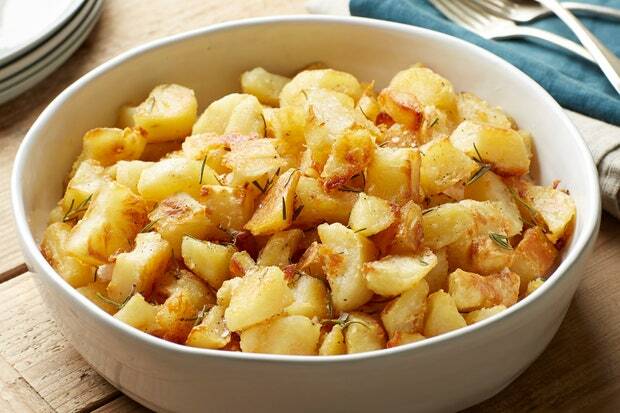 Flip the potatoes, scatter with rosemary, and continue to cook until the potatoes are crispy and brown, 10 to 15 minutes more. Return potatoes to the oven to rewarm at 350°F for 10 minutes before serving.